Definition at line 137 of file llpanelavatar.h. Definition at line 543 of file llpanelavatar.cpp. Definition at line 550 of file llpanelavatar.cpp. Definition at line 561 of file llpanelavatar.cpp. Definition at line 623 of file llpanelavatar.cpp. References LLPanel::childSetEnabled(), LLPanel::childSetVisible(), llendl, llinfos, mURL, and mWebBrowser. Definition at line 652 of file llpanelavatar.cpp. Definition at line 658 of file llpanelavatar.cpp. Definition at line 668 of file llpanelavatar.cpp. 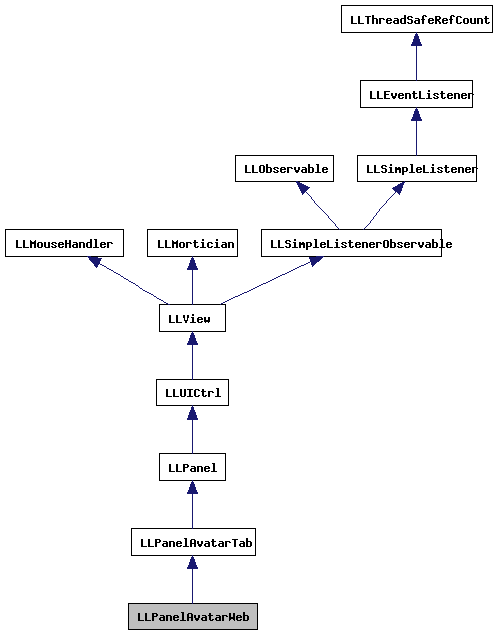 Definition at line 614 of file llpanelavatar.cpp. Definition at line 604 of file llpanelavatar.cpp. Definition at line 473 of file llpanelavatar.cpp. References LLPanel::childSetAction(), LLPanel::childSetCommitCallback(), LLPanel::childSetControlName(), LLPanel::getChildByName(), mWebBrowser, onClickLoad(), onClickOpen(), onClickWebProfileHelp(), onCommitURL(), and TRUE. Definition at line 567 of file llpanelavatar.cpp. References LLPanel::childSetEnabled(), LLPanel::childSetText(), LLPanel::childSetVisible(), LLControlGroup::getBOOL(), gSavedSettings, load(), and mURL. Definition at line 166 of file llpanelavatar.h. Referenced by load(), and setWebURL(). Definition at line 167 of file llpanelavatar.h. 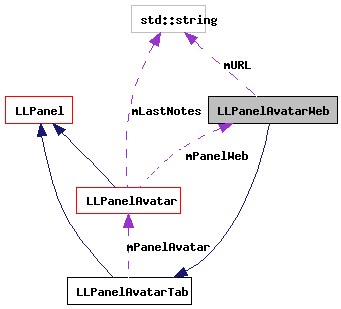 Referenced by load(), postBuild(), and ~LLPanelAvatarWeb().